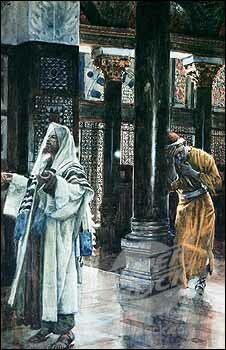 James J. Tissot, "The Pharisee and the Publican" (1886-96), watercolor. If we are to understand the Sermon on the Mount, we need to understand who the Pharisees are, since Jesus' exposition of what his Kingdom is like is contrasted with the dominant form of Judaism prevalent in Palestine in Jesus' time, as exemplified in the Pharisees. The Pharisees were a strict religious sect within Judaism that functioned as a political interest group seeking to reform society by bringing about a strict adherence to the Law, especially as it related to ritual purity. The name "Pharisee" is apparently derived from the Hebrew word perusim, meaning "the separated ones" or "separatists." The term "Pharisee," however, was what those outside the sect called them. The Pharisees themselves apparently didn't have a name for their movement. Rather they considered themselves the true Israel, and referred to themselves as "sages" (hakamim). After the destruction of the temple, they used the title "rabbi" for sages. The Pharisees, as a whole, were not the ruling class, though they sought to influence the ruling class. Nor were they of the priestly class, who tended to conform to the teachings of another religious sect, the Sadducees. Nor were they professional scholars like the "scribes" or "teachers of the law" (though some of these professional scholars identified themselves as Pharisees). The Pharisees were part of a voluntary lay movement that sought to bring a renewed understanding and enforcement of ritual purity in Palestine. F.F. Bruce traces the Pharisees to the Hasidim, the "godly people," groups of pious Jews after the exile, who began to meet for mutual encouragement. They deplored the inroads of the Hellenistic way of life into Judaism, and many supported the Hasmoneans and Maccabees in resisting the Greek oppressors and restoring the Temple to the pure worship of Israel's God. Later they broke with John Hyrcanus (which may be one explanation of the name Pharisees, "separatists"). The Pharisees were passionately devoted to the Torah. In the course of their study and application of the law they built up a body of traditional interpretation and application of the law known as "the tradition of the elders." Later generations of rabbis eventually wrote it down about the Second Century AD in what is called the Mishnah, consisting of sixty-two tractates or sections. Later yet, from 400 to 600 AD, a Talmud, or commentary upon and expansion of the Mishnah was developed. These are the basis of the Rabbinical writings that form the literature of present-day Judaism. The Pharisees' present-day descendents are to be found among the Hassidim, what we refer to in America as the Orthodox branch of Judaism. The men are distinguished by their three-quarter length topcoats, white shirts, and wide-brim black hats (and sometimes earlocks), the traditional clothing their ancestors wore in the Jewish ghettos of European cities. Since the Pharisees were passionate in their desire to obey God's law, they had developed over time an oral tradition, "the tradition of the elders," that put a "hedge" or fence around the Biblical commandments. The idea was that obedience to the tradition of the elders formed a barrier that would prevent a pious Jew from breaking a Biblical commandment itself. Here's an example, though it didn't seem to be an issue in Jesus' day, but much later. Exodus 23:19 prohibits cooking a kid in its mother's milk. A "hedge" around this law eventually because the requirement to keep a "Kosher kitchen," maintaining two separate sets of cooking utensils, one for dairy products and the other for non-dairy cooking -- lest one might inadvertently get some minute portion of milk in a pot that was cooking the meat of a young goat. Over time, this "tradition of the elders" became a law unto itself, and it is with this oral tradition that we find Jesus clashing. Here are some examples of how this "tradition of the elders" in Jesus' day sometimes conflicted with the true Law in the Word of God. Refrain from work on the Sabbath (Exodus 20:8-11) Harvesting is work. Plucking a handful of grain is harvesting. Therefore Jesus' disciples were guilty of breaking the Sabbath by eating some grain plucked in the fields as they passed through (Matthew 12:1-2). Healing is the work a physician performs. Therefore one cannot heal on the Sabbath (Matthew 12:10). Tithe, give one tenth, of your income to the Lord (Malachi 3:8-10) Tithe everything, even down to garden herbs (Matthew 23:23). Jesus does not reprove them for this. Priests are to wash their hands in the Laver before offering sacrifice (Exodus 30:17-21) All people are to wash hands before eating lest they pass ritual uncleanness to food, which, when eaten, would render the whole body unclean. Not as a hygienic precaution, but a ritual act of pouring water over the hands up to the wrists (Matthew 15:2). Honor your father and your mother (Exodus 20:12) Money may be dedicated to God, which relieves a son from the responsibility of using that money to support one's parents in their old age (Matthew 15:4-6). When a person makes a vow, swearing in the name of the LORD to perform some act, he must keep his vow (Exodus 20:7; Numbers 30:2). The Pharisees had developed a deceptive method of swearing. If one swore by the temple, the vow meant nothing, but if one swore by the gold in the temple, then one was obligated to keep one's vow (Matthew 23:16). It must be said in their favor, that the Pharisees were not lukewarm about their faith, but zealous -- though sometimes misdirected. The Apostle Paul was raised as a strict Pharisee (Acts 26:5), and sought to purify Judaism by rooting out what he perceived to be the Christian heresy. Jesus faulted the Pharisees at two points in particular. Many were hypocrites, in that they were much more concerned with the outward appearance of piety and righteousness than with having a pure heart towards God (Matthew 23:5ff and 23:25-28). Jesus also agreed with them on a number of points. We'll examine some other teachings of the Pharisees later in our study.